“PCT 56 WATER REPELLENT TECHNOLOGY” was formulated in 1991 when an AAC Mining Shaft was threatened with closure due to extensive shaft concrete failure which effectively put the lives of underground personnel at risk. PCT 56 WATER REPELLENT TECHNOLOGY was formulated and successfully treated all the pourious cementitious surfaces at the mine. PCT 56 experienced tremendous growth and success since then and has a very extensive track record. “PCT 56 WATER REPELLENT TECHNOLOGY” however ,remains the “flagship” and the basis for how PCT products work. A wide range of water and solvent based paint products and sealers are available for sale to prevent paint failures on moist areas caused by water penetration or dampness. Some of these products are of superb quality and contain synthetic fiber to add extra body or are used in conjunction with synthetic wool or membrane. However, these products are all based on generic polymer binders, are expensive and do not offer a permanent cure to the destructive properties of water, moisture or dampness. 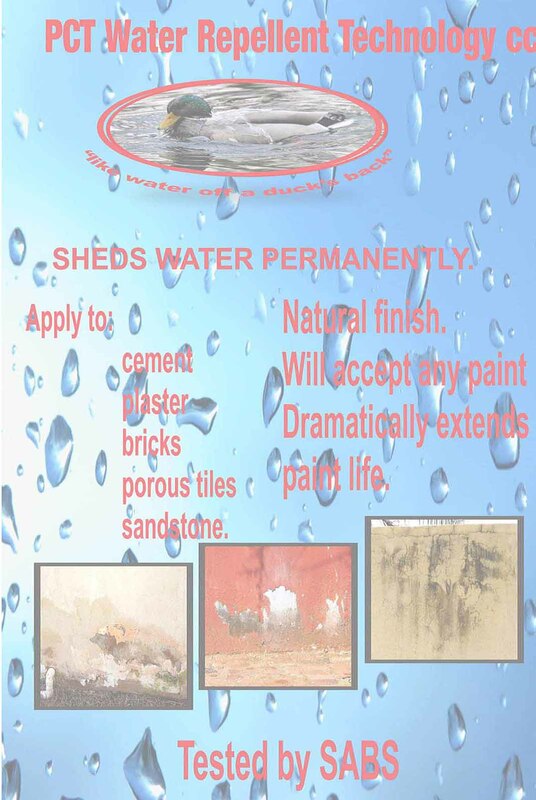 During 1991 PCT developed a chemical procedure or treatment to permanently prevent penetration of water or moisture in all cement products and bricks. PCT WATER REPELLENT TECHNOLOGY is truly remarkable and has no similarity with any traditional paint products or waterproofing composites. PCT WATER REPELLENT TECHNOLOGY cures by chemical reaction when subjected to atmospheric carbon gases and oxygen and resultant water repellent properties are permanent.